Antonio Conte’s Chelsea side are set to host AS Roma in the UEFA Champions League 2017-18 group stage game on Wednesday night, 18th October 2017 at Stamford Bridge. Having lost two back to back Premier League matches, Conte will be hoping his Chelsea side can turn up and get the important three points against Roma which will almost ensure their passage to knockout stages. Roma on the other hand a tough nut to crack and if they can get a result against Chelsea it will really open up this group. The game starts at around 20:45 CET / 19:45 uk time and BT Sports has live coverage rights in the UK. 11′ 1 – 0 David Luiz scored with a superb freekick in 11th minute of the game to put Chelsea in lead and take command of the group. 37′ 2 – 0 Eden Hazard made it 2-0 as Chelsea dominate at Stamford Bridge. 40′ 2 – 1 Aleksandar Kolarov pulled one back for Roma just before the half time. Chelsea secured a dramatic 2-1 win over Atletico Madrid at the Wanda Metropolitano in their last champions league game. Which put them top of the group with perfect record and looking at things that win might prove so important moving forward in the group stages. If Chelsea can get positive results against Roma in next two matches they are all but assured knockout stages berth. 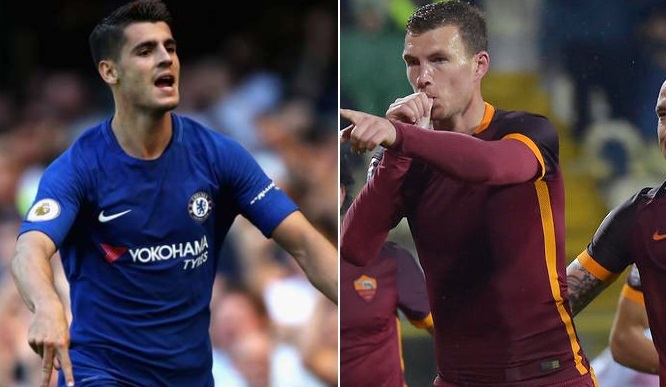 Chelsea vs Roma Team News & Lineups: AS Roma on the other hand won against Qarabag but could only secure a point against Atletico Madrid. Roma will be hoping to win at least one of the next two games against Chelsea which will put them in rather comfortable position to make it out of group stages. Chelsea will be without N’Golo Kante and Danny Drinkwater causing some selection headech for Antonio Conte for midfield places. while Victor Mosses is also ruled out for a month but Alvaro Morata might be fit enough to start against Roma on Wednesday night. This is how I expect both teams to lineup. Match Predictions: Chelsea are have one of those seasons where one game they are world beaters (Atletico) and the next week they lose against lower table teams. If the trend continue Conte will be in trouble by festive period. However with key players getting back to full fitness Chelsea are more than capable of mounting a real unbeaten streak just like last year. I expect them to see off this Roma side on Stamford Bridge on Wednesday night.